Play a wide range from beginner to advanced "Hyakunin Isshu" song　Karuta. "Hyakunin Isshu" is, 100 people of Waka poet, in Wakashu that was made by selecting one by neck every one, "Ogura Hyakunin Isshu" used widely as Above all song Karuta is, Teika Fujiwara selected in the lodge of Kyoto Kokura-san it's as it is said, has become synonymous with "Hyakunin Isshu". Been popular as tradition of New Year from the late Edo period around, from tanka reader 100 song to be used in play that takes a reading bill the Yomifuda is, it is listed in the Anthology of waka poems such as any "Kokin Wakashū" "New Kokinshu" the chosen are, short various rhetorical finesse such as Kakekotoba in the waka is used, it is also a good teaching materials feel free to learn a classic because it also contains examples of grammar, such as response of adverbs. 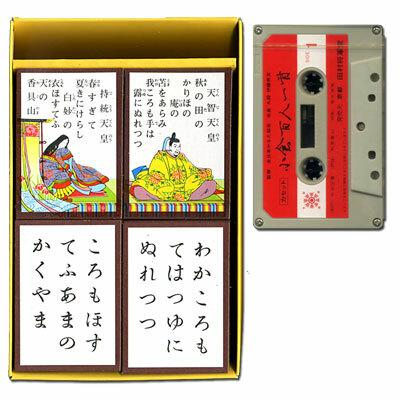 This, "Ogura Hyakunin Isshu Miyabi" is, recitation with tape with retro taste in pure Japanese karuta that have been made in Kyoto.